September 2017 - S.A.I.C. Technology s.r.l. Find the wordpress log file. 5444 "http://www.saic.it/wp-login.php" "Mozilla/5.0 (Macintosh; Intel Mac OS X 10.11; rv:52.0) Gecko/20100101 Firefox/52.0"
The best way to enable the production mode for an Angular 2 application, is to use angular-cli and build the application with ng build -prod. This will build the application with production profile. Using angular-cli has the benefit of being able to use development mode using ng serve or ng build while developing without altering the code all the time. To check if user entered email mailbox.does.not.exist@webdigiapps.com really exists go through the following in command prompt on windows / terminal on mac. The commands you type in are in green and the server response is in blue. Please refer to MAC & PC screenshots towards the end of this post. 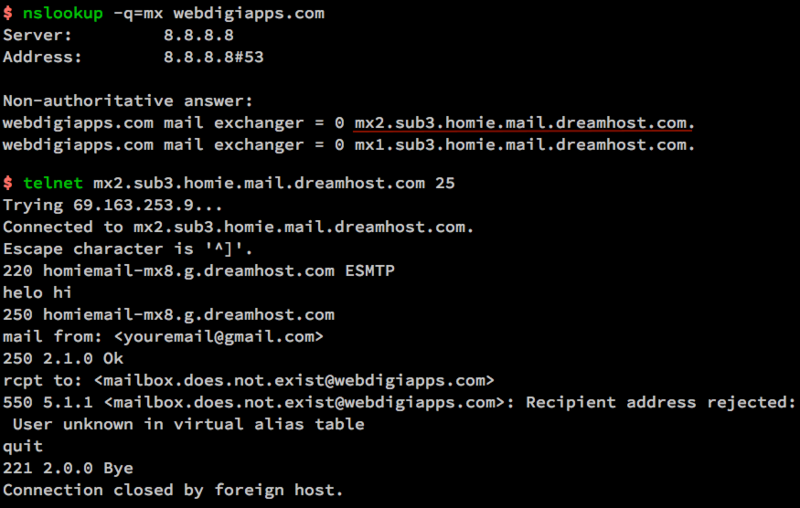 webdigiapps.com mail exchanger = 0 mx2.sub3.homie.mail.dreamhost.com. webdigiapps.com mail exchanger = 0 mx1.sub3.homie.mail.dreamhost.com. Step 2 – Now we know the mail server address so let us connect to it. You can connect to one of the exchanger addresses in the response from Step 1. The important thing to remember as we go forward is that ORDER MATTERS! Rules are executed from top to bottom. Note that Rules are applied in order of appearance, and the inspection ends immediately when there is a match. Therefore, for example, if a Rule rejecting ssh connections is created, and afterward another Rule is specified allowing ssh, the Rule to reject is applied and the later Rule to accept the ssh connection is not. At the top of the /etc/sysconfig/iptables (Centos 7) the rules are more important !! Instead of using the default policy, I normally recommend making an explicit DROP/REJECT rule at the bottom of your chain that matches everything. You can leave your default policy set to ACCEPT and this should reduce the chance of blocking all access to the server. Allow Internal Network to External network. Next, make sure all the remaining incoming connections jump to the LOGGING chain as shown below. Next, log these packets by specifying a custom “log-prefix”.